UN Secretary-General blasts deadly attack on a camp for displaced Syrians in Idlib, calls for Security Council to refer Syria to ICC. UN Secretary-General Ban Ki-moon said Friday he was "outraged" by the deadly attack on a camp for displaced Syrians and said those responsible must face justice. 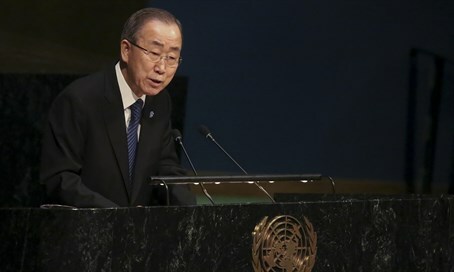 Ban demanded once again that the UN Security Council refer Syria to the International Criminal Court so that the tribunal based in The Hague can open up investigations of possible war crimes. "Those responsible for yesterday's seemingly calculated attack against civilians in the camp in Idlib, which could constitute a war crime, must be held accountable," said Ban's spokesman, according to AFP. Women and children were reported to be among 28 civilians killed in the raids near the Turkish border, which also wounded 50. The strikes in Idlib province, which is controlled by Syria's Al-Qaeda affiliate Al-Nusra Front and rebel allies, came as a 48-hour ceasefire took hold in the battleground city of Aleppo to the east. UN spokesman Stephane Dujarric said it was "difficult to believe" that the air strikes were "a mistake", adding that there needs to be further investigation to determine who is responsible. The United Nations is working with its partners on the ground to collect information about the attack, said the spokesman, adding that countries that "have military assets should also take a look" at what happened. Both Syria and Russia denied that the camp had been hit by an air strike and suggested that rebels could have shelled the site. A bid by the Security Council in 2014 to refer Syria to the ICC was blocked by China and Syrian ally Russia, and it appeared unlikely that a new push for such action would garner support from the veto-wielding members. Ban has said that the starvation sieges and hospital attacks during Syria's five-year conflict are war crimes and that the ICC should put those responsible on trial. Syria's conflict erupted in 2011 after anti-government protests were put down. Fighting quickly escalated into a multi-faceted war that has killed more than 270,000 people and forced millions from their homes.